Board Battlefield is a turn based strategy game from Surrealscape Studios. It plays like a simplified version of Chess, with dice. Get the satisfaction of the strategic play of Chess but at a much lower investment of time and effort. A single game lasts around 10 minutes. Good for a quick strategy fix. Plus, the ability to play multiplayer with friends adds lots of replay value. The game is played between two players on a 9×9 square grid. The objective is to capture the Flag Square of the opponent while preventing the opponent from capturing yours. You have infantry, tanks and rocket artillery to help you accomplish this and with further options to unlock paratroopers, strike aircraft, missile cruisers and more. Earn reputation and gold for every enemy you destroy and for every match you win. Level up to unlock and deploy more options like the landmine, transport helicopter, fighter aircraft and missile cruiser. Plant landmines to surprise enemy infantry. Use helicopters to airdrop your forces behind enemy lines. Call in air strikes to destroy enemies on the ground. 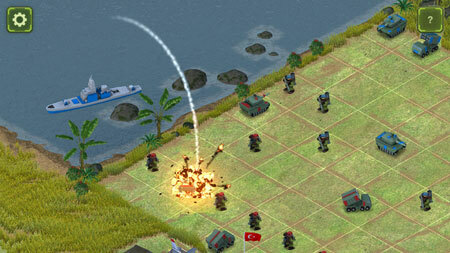 Deploy a missile cruiser to strike deep into enemy territory. If you get stuck in the game, check out the video walkthrough and gameplay for the game. This entry was posted in PC Games, Walkthrough and tagged Board Battlefield Cheats, Board Battlefield Game, Board Battlefield Gameplay, Board Battlefield Guide, Board Battlefield Hints, Board Battlefield Review, Board Battlefield Solutions, Board Battlefield Strategy, Board Battlefield Tips, Board Battlefield Walkthrough by Marvin. Bookmark the permalink.